St. Lucia is the type of destination that travelers dream of when they come to Castaway Travel seeking a small, relatively unknown Caribbean island that embraces couples, groups and families alike. The lush flora and fauna coupled with the magestic Pitons give visitors a taste of the South Pacific with a more manageable travel time from the eastern side of the United States. Saint Lucians are well-known for their warmth, charm and willingness to share their beautiful homeland with world travelers. The temperature averages 70 to 90 degrees year-round with comfortable trade winds providing the perfect environment for zip lining through rainforests, shopping on Bridge Street in Castries or just laying on the volcanic rock beach with a local rum drink. The island is full of lodging options for any lifestyle from beautiful villas to quaint boutique properties to family-friendly all-inclusives. You can even stay on a working chocolate plantation. 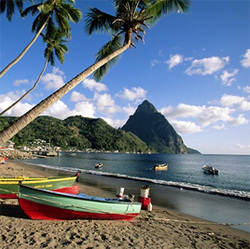 Saint Lucia is known for its romantic hideaways as highlighted by the popular Bachelor television series. The only travel agent in the state of South Carolina with a Preferred Agent status with the Saint Lucia Tourist Board, Anne Lisle can use her knowledge and experience to make your Saint Lucia getaway exactly what you envision.